13. Thirteens – Mister, is this right? Why did we choose this problem? involve some sort of “play” before choosing a specific strategy. You have to experiment, observe patterns, struggle, and adapt before finding a more elegant strategy. For us, this is what mathematical play looks like. 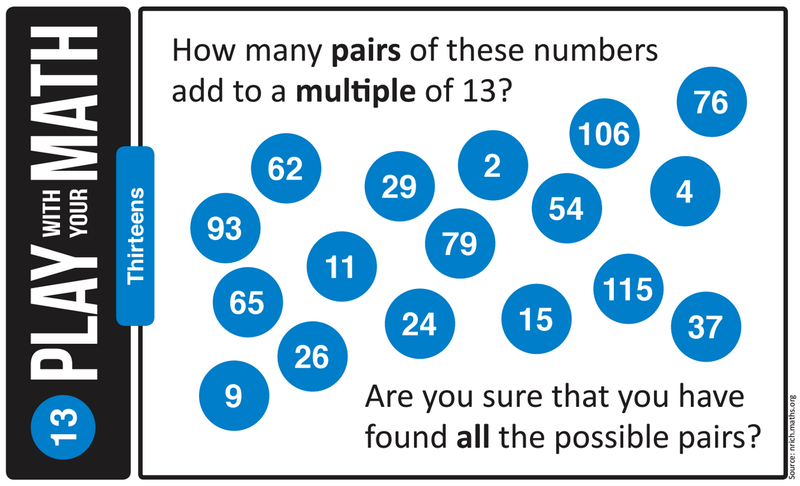 This problem is extremely accessible, requiring just integer addition and division in order to test each pair. The need to organize the results and systematically test all potential options is no easy task, creating a need for certainty and the desire for a more efficient and elegant strategy. While this problem did not prove all that difficult for me or Ms. Yu, we conjectured that the solution strategy would prove particularly counterintuitive to our students. This problem was already succinct and even presented as a poster. We knew it would be possible to present this problem visually, we just needed to decide how much to change. Modification #1: 13 instead of 11. We opted for the Thirteens version of the problem for a few reasons: because it was time for Play 13, because we released it on Friday the 13th, and in order to make the problem more challenging. We included the Elevens version on our handout as a scaffold. Modification #2: Ditch the table. There is no apparent reason why the numbers should be organized in a square grid. Is this intended to help someone solve the problem? 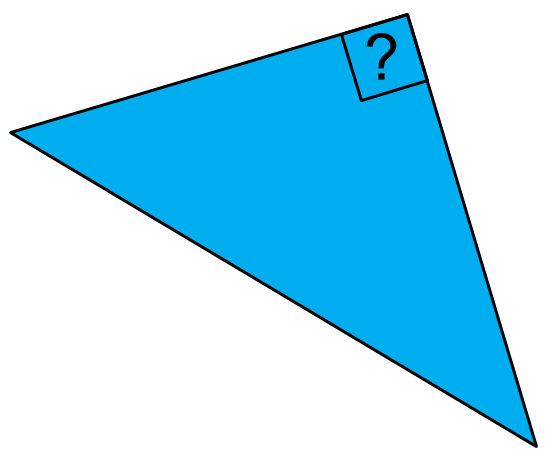 Or might it distract people from the essential features of the question? Instead, we opted to organize the numbers haphazardly. One of my students took one look at the problem and cleverly asked if he could use the 13 at the top. Then we looked to see if it would make a difference. I had a Problem Set work day in one of my classes on Friday, and a few students worked on this problem for the entire period. Several students kept track of their answers by connecting the circles with a line; however, this became difficult after a while. Perhaps we could have made this easier by arranging the numbers in a circle … or maybe this is the perfect result, creating a need for systematic counting and organized results. On a similar note: Ms. Harding solved the problem and organized her results in a much different way than I did. One student found all but one of the pairs. When I asked him if he thought he had them all, he said he thought he did, but he wasn’t sure. Exactly! While you don’t specify the class year of the students who were given this task, we’d peg it at Y4 or Y5 of primary school. NRICH seems to think this is secondary school mathematics, but addition, subtraction, multiplication and division of whole numbers are all primary school skills. so if you add any -2 number to any +2 number, the sum is divisible by 13. Thus, those 10 numbers give 5×5=25 pairs, etc. 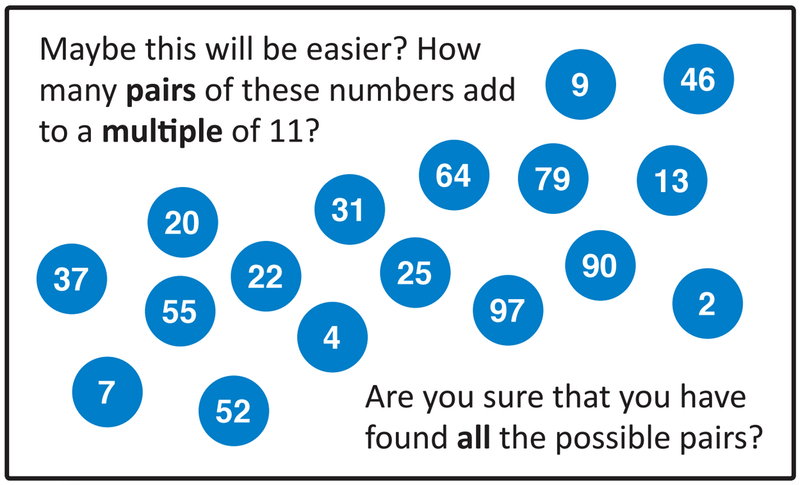 This problem is a good example of modular arithmetic, an oft neglected primary school topic. Incidentally, NRICH’s original name of “Elevenses” is cute, as this is a British word for morning tea time. First, thanks for the comment and sorry that it took so long for me to reply. I’ve been meaning to write a response for a while. Also, I’m a big fan of your site. Second, we (the people behind Play With Your Math) work at a high school and use these problems with students in grades 9-12. Third, talking about THE target age group for a problem is antithetical to our goals with Play With Your Math problems. I only teach fairly high achieving juniors and seniors, but we want to engage the entire school in math-based play. Our most successful problems have even engaged members of the staff and not just the math department. As such, we want every problem to have the complexity to challenge our AP Calculus students and an entry point for students struggling through early algebra. I agree that this problem is appropriate for grades four and five. But I also claim that this problem is appropriate for precalculus and calculus. Because modular arithmetic is “oft neglected” and remainders are mostly forgotten, our students need to be clever and creative in order to consider this strategy. In fact, I’ve thus far only seen brute force approaches. Hi, I’m a former math teacher, current math tutor. I’ve been using these problems when I tutor two advanced elementary school students (ages 9 and 11) who want math challenges. First of all, thanks for the great problems – I did “Split 25” with my students last week, and both of them were transfixed. Secondly, you probably thought of this already, but I don’t think you need to use modular arithmatic to come up with an elegant solution. My first thought was to take each number and divide it into groups of three and groups of ten. For instance, 93 has either 9 tens and 1 three, or 6 tens and 11 threes (30 = 10 threes), or 3 tens and 21 threes. If I divide up all the numbers this way, I can easily count the numbers of tens and threes I’ll have when I add two of the numbers together. 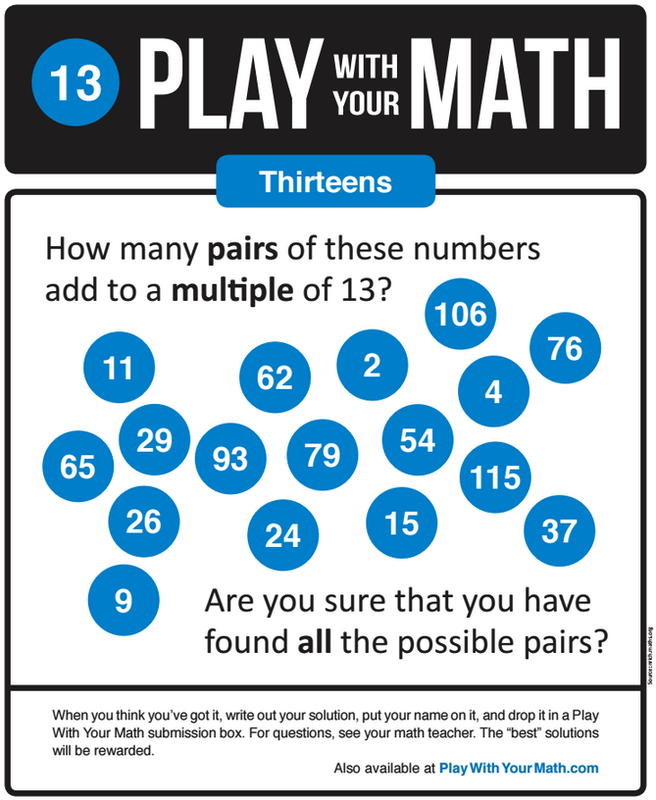 Since multiples of 13 will have an equal number of threes and tens, it becomes pretty simple to match up the numbers to make equal groups of tens and threes. Thank you so much for sharing this task and all of the other Play With Your Math tasks. Ben (http://matheducators.stackexchange.com/users/262/benjamin-dickman) referred me to your website. These are great accessible tasks and I really like the effort you are putting into formatting them in a design sensitive way. I am smitten with this project. Anyways, I have been trying to teach myself the Python programming language, and “Thirteens” was a great problem for me to work on solving using Python. I posted my solution (http://repl.it/kta/2) — click “run”. I put in LOTS of comments with the hope that one could understand the code even without knowing how to program. Also, I wrote the code so that it could be used to solve any collection of numbers for multiples of anything. This is your semi-regular encouragement to get a email subscription form up on playwithyourmath. And lots more posters!